LOS ANGELES- March 14th, 2019- Garth Brooks has received iHeart Radio's inaugural Artist of the Decade Award. 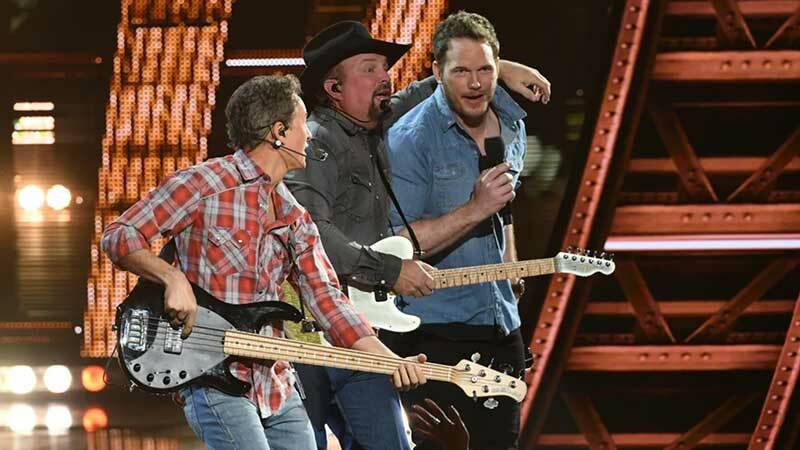 The award was presented to him tonight at the iHeartRadio awards in Los Angeles by Chris Pratt. And what a decade it has been! In 2016, Garth received his seventh Diamond Award from the RIAA for The Ultimate Hits. The Diamond Award is awarded to albums that have sold more than 10 million copies. In 2017, he ended The Garth Brooks World Tour with Trisha Yearwood. The tour sold over 6.3 million tickets, making it the biggest North American tour in history and the biggest American tour in the world. In 2010, Garth Brooks sold out nine concerts in Nashville to benefit the Nashville flood relief. He sold over 140,000 tickets and raised over $5 million, with every cent going to the flood relief. In 2013, Garth wrapped up a historic four-year run at the Wynn Hotel in Las Vegas, which led to the CBS special, Garth Live From Las Vegas. It won the night in the ratings for CBS with nearly nine million viewers. In 2016 & 2017, Garth won Entertainer of the Year at the CMA Awards, for a fifth and sixth time, both a first for any artist. In 2018, Garth Brooks: Live From Notre Dame! aired on CBS with nearly ten million viewers tuning into watch live and on DVR. In their press release, iHeartRadio said, "Garth Brooks will receive the first-ever iHeartRadio Artist of the Decade Award for his impact on the music industry as one of the world’s most successful and beloved artists. Brooks is the first recipient of this award, created to honor his outstanding achievements. He is the #1 selling solo artist in U.S. history, with more than 148 million albums sold. He also is the first-ever artist to be awarded seven diamonds by the RIAA for having seven albums certified with more than 10 million sales each. Since the 1990s, Brooks has had nine #1 albums on Billboard’s Top 200 and 17 #1 albums on the Top Country Albums chart, spending more weeks at #1 on the album sales charts than any other artist since Soundscan’s inception. Brooks was recently named the inaugural inductee into the Live Music Hall of Fame and has been inducted into the Musicians Hall of Fame, International Songwriters Hall of Fame in New York, the Nashville Songwriters Hall of Fame and the Country Music Hall of Fame. The recent Garth Brooks World Tour with Trisha Yearwood smashed Brooks’ own previously held records by selling 6.4 million tickets, making it the biggest North American tour in history. In 2018, Brooks performed the first-ever concert at Notre Dame and sold out 84,000 tickets in under two hours."